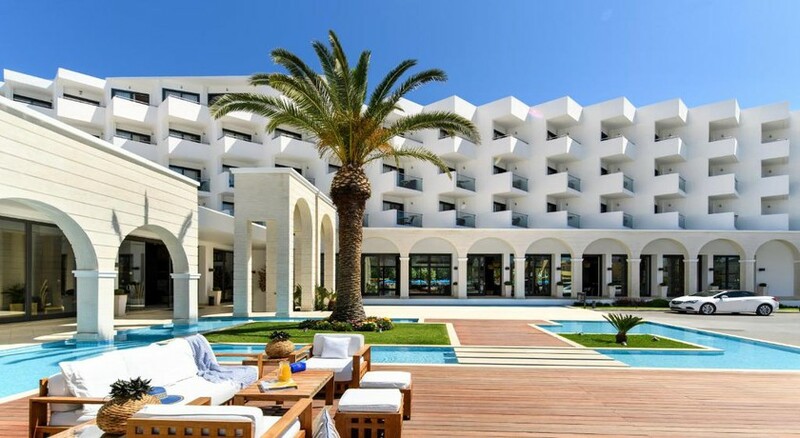 Situated near the stunning sandy beaches in the Falraki village, Mitsis Faliraki Beach Hotel & Spa is a famous 5-star hotel. It is about 14 km from the town of Rhodes and 5 km from the Afandou. The beachfront hotel features swimming pools, playgrounds for kids, water slides, mini club, spa and wellness centre, tennis court, basketball court and a number of sports and leisure facilities. It also features educational activities that are supervised by trained staff who strive to provide the perfect environment for families to spend an entertaining and a fun-filled vacation. Guests can also head towards the beautiful sandy beach to play volleyball and/or relax on the sun beds. The hotel features 348 guestrooms, all of which offer luxurious accommodation – an ideal place of stay for families and business travellers. 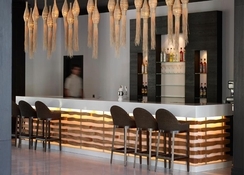 There are 6 restaurants and a clutch of fine bars to take care of the guests' dining and drinking needs. The hotel is located on the east coast of Rhodes. The sandy beaches are 10 meters from it. The Rhodes International Airport is 12.2 km and the port is 13 km from the hotel. Various supermarkets and restaurants such as McDonalds are available within 1 km. The Rhodes town is about 14 km from the hotel. All the 348 guestrooms at the hotel are elegantly designed and well-furnished with all room amenities. 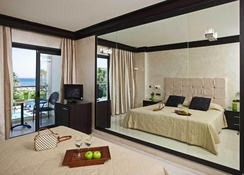 There are Superior Standard Rooms, Superior Double Rooms (with sea view), Superior Family Rooms, Superior Double Rooms (with private pool), and Quadruple Rooms. All rooms have individually controlled air-conditioning and heating facilities, private bathrooms with bathtub/shower, wall mirror, hairdryer, direct-dial telephone, mini-fridge, satellite TV with 40 channels, balcony/terrace and safety deposit box (extra charge). Also, 29 of the double rooms have a private swimming pool. 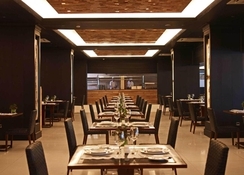 The main restaurant serves breakfast, lunch, and dinner in buffet style. 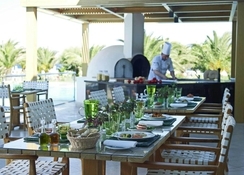 Guests can also eat at the Ellinadiko Greek à la carte restaurant (early booking is required). Other à la carte options include Italian, Mexican, and Asian & sushi restaurants all requiring early reservation. The Gelateria and Creperie serve refreshments and hot/cold beverages from 10 am to 2 pm. 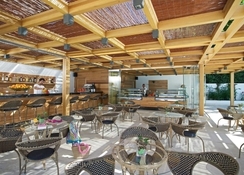 Situated near the swimming pool is the Piazza Cocktail Bar, available all day long, where guests can enjoy refreshing drinks, snacks, ice-cream, and even an afternoon cake. The all-inclusive package includes breakfast, lunch, dinner, local wines (red, white and rose), draught beer, juices and soft drinks. The Mitsis Faliraki Beach Hotel & Spa features a large outdoor swimming pool with sun terraces having loungers and parasols. Pool and beach towels are provided (deposit required). Daytime leisure activities include aerobics, aqua aerobics, basketball, darts, football, table tennis, and volleyball. Evening entertainment programs offered here include magic shows, music shows, dance shows, and a Greek night. There is a fun and exciting kids’ club at the hotel for children aged 4-11. Other amenities for children include a mini-disco and a playground. The hotel also offers wellness services such as spa, massage, and beauty treatments. All the staff were great, very helpful. Food was of a good standard, the separate restaurants were fantastic. The entertainment staff were fun, but not overbearing.